Who are the kings in the Cay-Yale trumps? Re: Who are the kings in the Cay-Yale trumps? Thanks for the correction, Marco. Tolfo does say the letters on the CY Faith card are now illegible. She even says it's a bit strange that Marziano would be on this card, since he was identified "with a heretic," which I assume means the same as "as a heretic." Let me say more. After saying this, she later gives the suggestion that it is not strange at all, because in the Empress card the deck is recognizing a heretic as Empress. And if Kaplan is right, the bottoms of these theological virtue cards are supposed to be examples of the opposite of the top. So maybe it's not so strange that Marziano's signature is on the card after all. And maybe three years after his "disappearance" isn't such a long time before another deck of his, besides the Michelino, to make its appearance. (She thinks the deck was done in 1428.) I was picking up on what I saw, or imagined, as a certain irony in Tolfo's earlier remarks, which I then (unconsciously) used as a basis for misremembering her. All I can say about her remarks is that taken as a whole they lead me to think that in the end, from her perspective, it is not strange that Marziano's name would be on the card. I myself still see "m a r t"--at least in the image the way I originally posted it. (It is possible to get too close and have too much contrast or too little.) Other letters don't even occur to me until people point them out, and even then they seem strained. Why would these letters be on the card? Well, I think the letters are there because the designer of the deck wanted to say that the CY was a deck with good Christian images, not idols like Marziano had. 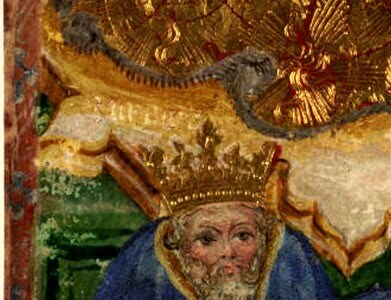 He is lumping Marziano in with King Ninus in order to sell his not very original product to Marziano's critics. He has taken Marziano's game, which people either knew or could read about, and tried to make it more acceptable. In other words--I might as well say it--I think the game that was later called "tarot" was originally invented by a Christian humanist who thought there was wisdom to be gained from pagan mythology, both the "good guys" (virtues, virginities) and "bad guys" (riches, pleasures) among the Greek gods. The CY is a Christianization of that game, a response to criticism of its idolatry, and its designer wanted to distance himself from its originator. At the same time, I suspect that it is probably inappropriate to say that there was any one inventor of tarot, just as there was not any one inventor of the automobile (whatever Obama says, Frenchmen invented an impractical steam version, Germans gave it a decent engine, and Americans just made it a consumer item). Dorez lists who was usually put for the antitypes: for Faith,"Machomet" and "Arius hereticus" (or just Arius). The first is on p. 52 of Canzone della Virtu e delle Scienze, the second on p. 82. For Charity it is usually some spelling of "Herodes", e.g. sometimes "Erodes", sometimes with "inique" or "impius" or "crudelis" (p. 82). On p. 52 there is another spelling "Heres", which Dorez interprets as "Herodes". The king we were talking about could be "Machomet", I suppose. But I still think there is an "r" and a "t" after an "a". Not crowned - but this is the Faith/Mochamet that I mentioned previously (in another thread).